We met at Oceans East at 0600 (that's oh dark thirty for most sensible people.....) to grab some bait and made our way to the beach. We decided to focus our efforts today on the two primary species I already mentioned, but we also took a couple items in case we spotted Mr. Brown (aka Cobia) or wanted to try for some flounder. We launched into the peak of max outgoing current running at .8 this morning, but there was little to no wind, so the unfavorable tide was a non-factor. In minutes, we were setup and ready to drop our lines in the water. Joe hooked up right away, but the fish either buried itself in the rocks or wrapped the bridge piling and snapped the line. Joe re-tied his setup and dropped again and was rewarded with another strike but this one came off, too. Even the flounder didn't want to cooperate today. Joe had similar results with the big difference being that he was able to land a 16.5" croaker!! While the sheepshead will most likely have to wait until next year for me, I will be back a few more times this year to chase after the togs before I change gears and get ready for the big striper run that happens around holiday time. A great day on the water indeed, made even more memorable by spending time on the water with a friend. Thanks Joe!! Tight lines, be safe, and get on' em!!! This past weekend marked the passing of another year in my life celebrating 42 years of age - my how time flies. I didn't have any real aspirations or desires for the weekend save for the opportunity to kick back and enjoy time with the family. The weekend started off with a roar on Friday night when I took the whole family to see Garbage play in concert at The National here in Richmond, VA. They sounded awesome and played several of their new songs as well as some "oldies", including my personal favorite - I'm Only Happy When It Rains. Saturday morning came all too early and the winds were blowing pretty strong. My wife had a "Color Run" that morning, and I want nothing to do with that - too much like work that early in the morning for my tastes. 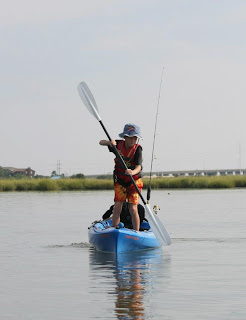 While she was doing her benefit run, I took the opportunity to do some minor rigging on my son's kayak for a trip to the water later in the day. I added a YakAttack Mighty Mount in the front, so my son or wife could use one of my RAM Mount rod holders. I also rigged up a makeshift anchor trolley using some spare floating anchor line I had. I think the only thing left to add are two RAM Tube rod holders for the rear tracks. After my wife came home and cleaned up, I checked the winds at my planned launch and even checked with two fishing buddies (Joe and Darren) on the weather and water conditions. They advised me not to even try it - waves of 2 feet at the launch and winds gusting over 20mph. With that new information in hand, we decided to stay a little closer to home and do some bank fishing at a local pond. We each caught a few small 8-10" largemouth bass, and I even managed to snag a fat snapping turtle who was none too happy about it. He wasn't the biggest I had seen, but at 14" in length down his shell, he was still pretty hefty. We wrapped up the day with a couple errands and then some play time outside back home. Sunday morning came and the weather had calmed down significantly overnight. I checked the conditions online for the same launch from the day before and found that the winds and rain weren't supposed to move in until around dinner time, so we loaded up the kayaks and made our way to the water. We launched into the start of the outgoing tide and made our way quickly to the inlet and adjacent shallow bay. The winds were really calm, and the current wasn't too swift. Even though the outgoing tide was moving swiftly at the mouth of the inlet, it wasn't too fast in the shallow bay so holding position was relatively easy, and neither my wife nor I had to use the anchors. 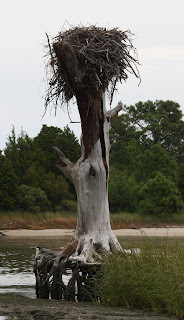 My wife was able to capture some real cool nature shots during our outing as well. Good thing too, since my camera photos were all blurred from my past trip where water got on the camera lens. Lesson learned - clean your optics before you launch. Some other kayak friends have informed me that Rain X works, so I will have to try that before my next trip. Here are some of the cooler shots my wife was able to capture. Enjoy!! Needless to say, it was a great way to spend my birthday. This past weekend was the annual Chesapeake Bay Kayak Anglers charity tournament to benefit the Coastal Conservation Authority and Make-A-Wish. 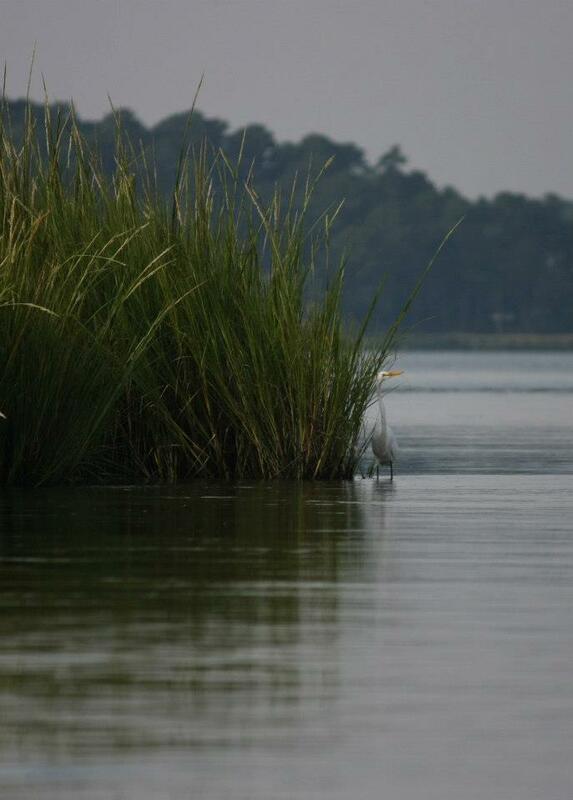 We had anglers from as far north as New York and as far south as North Carolina. The tournament had a pretty good turn out for only having been the second time with over 60 anglers joining the fray. Several folks arrived on Friday to pre-fish, and I opted to do the same having never fished the area. The weather on Friday was awesome with temps in the low 90's with a steady breeze all day. With an approaching storm front though, the winds began to gust at 15-20 and foretold of things to come for the following day. Before we even finished the Captain's Meeting on Friday night, the National Weather Service had issued a small craft advisory for the entire region. The advisory warned of a storm moving at 40 mph with winds gusting up to 72 mph. I knew that fishing too far from the weigh-in location would not be the best plan, so I found a cove on Kent Island about a mile and a half away and targeted there for my tournament. I ventured out to the bridge but found the waters to be too difficult to fish properly, so I sought the safety of the coves. I only spotted 2-3 other boaters out there as well, so I think I made the right decision. In the end, I caught several fish including 2 redfish, a smallish striper, 20 white perch and a spot - none of which were worthy enough to be entered, but still no skunk on either the pre-fish day or the day of the tournament. 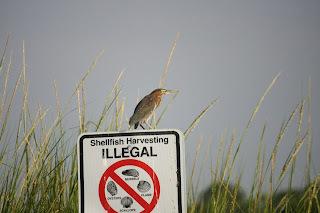 The fish sizes for the area are smaller than the fish I am use to catching or seeing caught down on the Hampton Roads/Virginia Beach & Chesapeake peninsula area, but we were all witness to a citation being entered. It wasn't the massive reds or gator trout us saltwater anglers long for, but the winning perch was measured in at 13" which is a Maryland citation. The raffle was a great time as well with most everyone going home with something, but we all were anxious for the top raffle prize - a 2012 Hobie Revolution 11. In the end, although I missed out on the new Hobie, I ended up with a nice Redington bag that retails for about $50, so it was worth it. This was a well run tournament from the folks over on MKF (snaggedline.com) and they deserve mad props for running it. A big thanks go out to the sponsors that contributed prizes for the raffles and placings in each division. 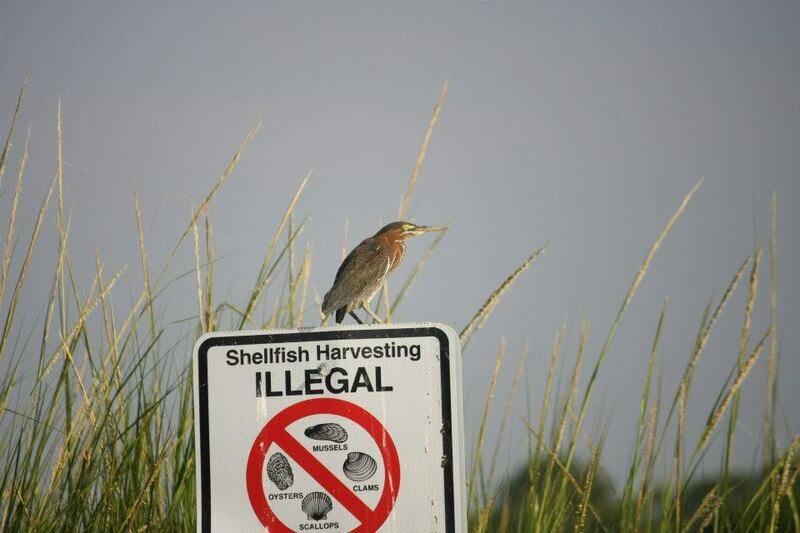 Tight lines, be safe and always always always keep a weather eye on the horizon! Over the last ten years, I have literally put a half a million miles on my vehicles, including over 235,000 on my current one. Going to dog shows everywhere east of the Mississippi and from New York to Florida almost every weekend during the warm months and field training with my dogs every weekend in Pennsylvania and Maryland during the cold months will do that. In all of those travels, I had never blown a tire, that is until this past weekend on 64 eastbound as my family and I headed towards the peninsula for a morning of kayak fishing. Needless to say, I was a little surprised, but I took it in stride and was fortunate enough to get my family off the road safely amidst the holiday traffic. After a quick phone call to my awaiting friends letting them know I would be a tad late, I began assessing the best way to change the tire safely and quickly. I took a mental inventory of my gear and deployed my son's milkcrate with my YakAttack VisiCarbon Pro safety light and a couple of custom SOLAS hi-visibility flags about 50 feet behind the vehicle and hung one of the VISICarbon Pro accessory lights from the rear tailgate to provide some measure of safety. After what I consider a reasonably fast tire change, we set off yet again only this time to find a quick stop to wash up before making our way towards our destination. We finally arrived albeit an hour and a half later than planned, but nevertheless we made it. 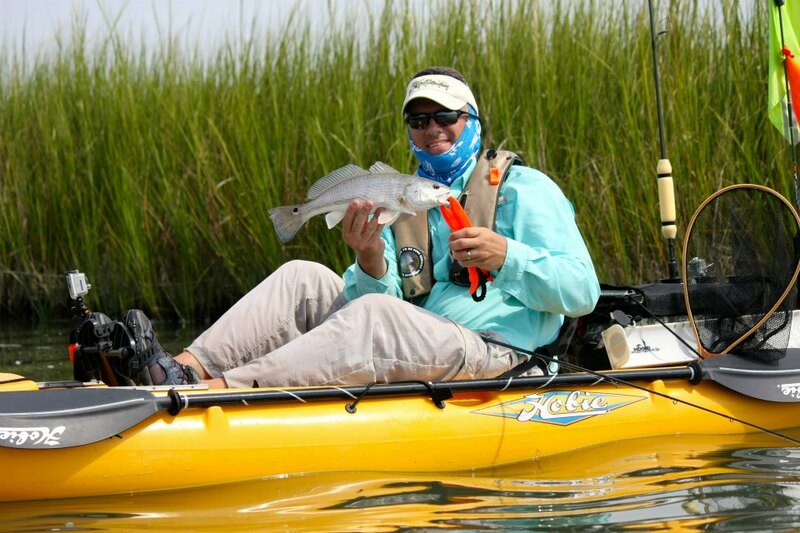 My good friend Mark Lozier of 1st Landing Kayak Fishing Services was kind enough to bring a spare kayak and paddle for my wife to use on this outing. After about 15 minutes of prep time, we were on the water and moving out of the Crab Creek launch to hopefully get on some fish for the remaining couple hours of the incoming tide. After slowly drifting along the main stem, we veered left at one of the deeper confluences and worked our way around to the backside of one of the grass islands. I had rigged up my wife and son with one of my Marsh Works 1/8oz jig heads and paired it with a Gulp! swimming mullet to increase their chances of getting on some fish today. 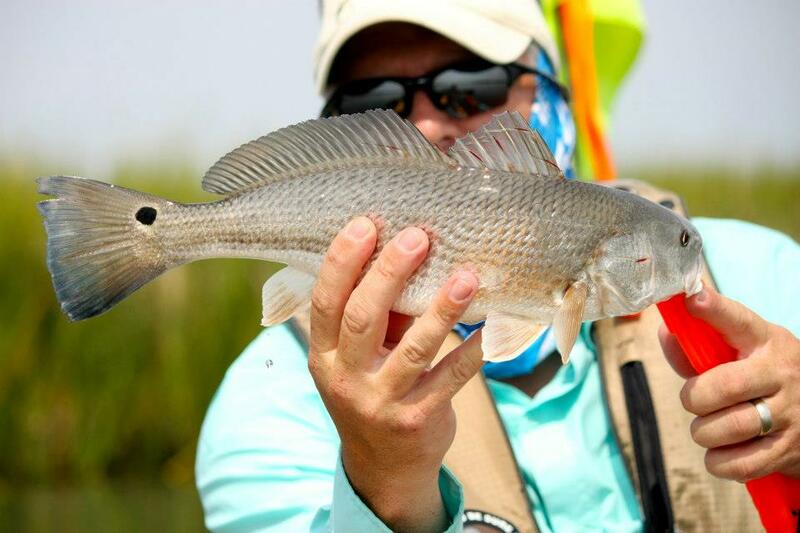 I started working the deeper cuts that run parallel to the grass islands, and it wasn't long before I felt the tell-tale bite of a redfish. A short fight with a couple runs and a chunky little 12" red made it's way into the kayak. 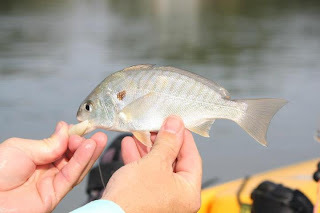 ....even had a croaker no larger than the pinfish but he was a little camera shy and was so small that holding him to get a photo for laughs was too difficult without risking injury to him, so he was let loose quickly. As we drifted along and explored a few of the creeks that cut through the grass islands, we came upon one of my favorite spots in Lynnhaven. It is a nice deep hole with two different creeks feeding into it creating a prime ambush point. I drifted past the hole and maneuvered so that I was facing the current while pinned against the grass but still far enough out of the current flow to avoid being pushed off the spot. I made my first cast past the hole and let the lure drift into the strike zone and was quickly rewarded with a hard take but the hook came unbuttoned. I made another cast to the same spot and was rewarded with another solid bite, but this time I got a better hookset and quickly realized I had a larger fish on. 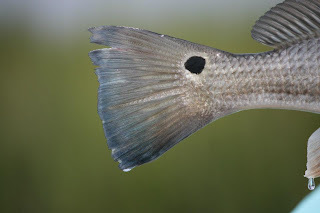 The hard runs left and right with some drag pullage were all the clues I needed to know I had a redfish on the end of the line, and he was not happy about it. After a minute long fight, the battle was over and the largest fish of the day was boated - a 16 1/4" fat red. ......no flat tire could ever quell or extinguish the feelings of pride and joy I had this past weekend as I shared time on the water with the family I love and try to provide for.